The Limited Edition Abe Sapien & Hellboy pins are torn from the pages of Mike Mignola's iconic Hellboy and B.P.R.D., published by Dark Horse Entertainment. These officially licensed pins are approx. 1-inch tall each. This soft enamel pin set is based on Mignola's gorgeous artwork and comes mounted together on a glossy black backboard. 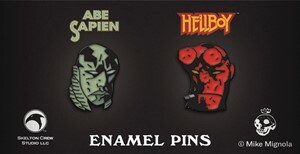 Each pin has two pinbacks so Abe and Hellboy are never caught upside down.